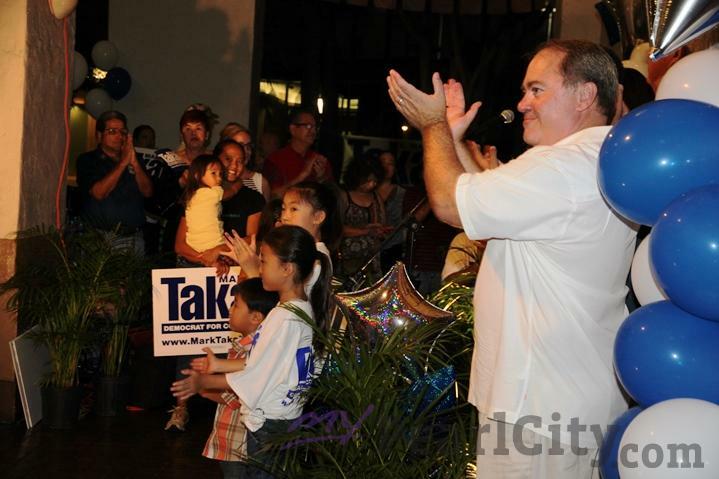 Mark Takai brought home a well deserved victory in the Democratic Primary Election for the U.S. House of Representatives Congressional District I. Takai, who was born and raised in Pearl City, led a team of supporters who worked hard throughout his campaign while sharing a common vision for the future, and a list of core values, that manifested itself in the voting public who got on board Team Takai resulting in Saturday night's runaway victory over runner-up Donna Mercado Kim. 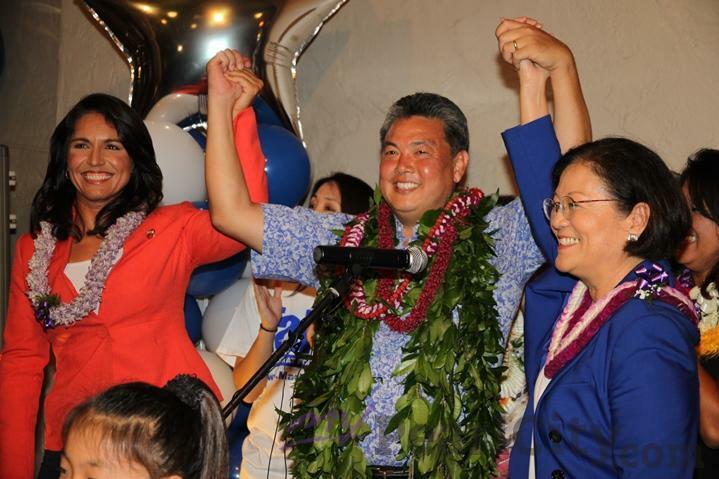 Takai tallied 48,512 votes (42.8%) to Donna Mercado Kim's 30, 979 votes (27.3%). 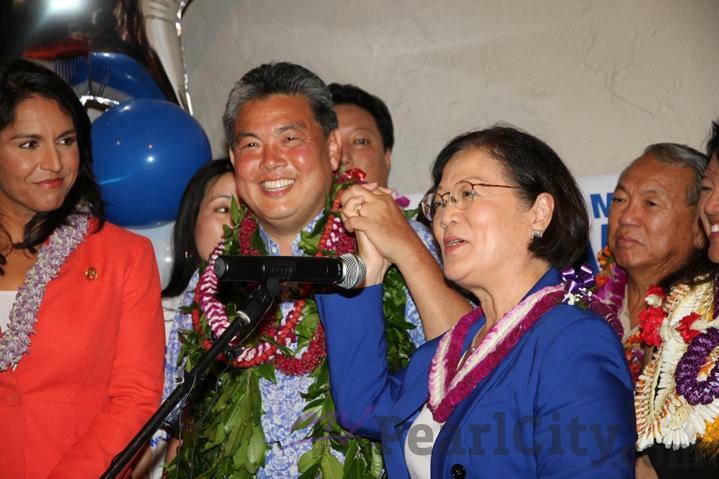 Takai will face Republican Charles Djou and Nonpartisan candidate Robert H. Myer in November's General Election. Takai took to the podium late Saturday evening at Ferguson's Pub on Bishop Street with his wife Sami and children Matthew and Kaila while being surrounded by dozens of supporters and the media following the third print out of election results that showed Takai well in front and on his way to November's General Election. 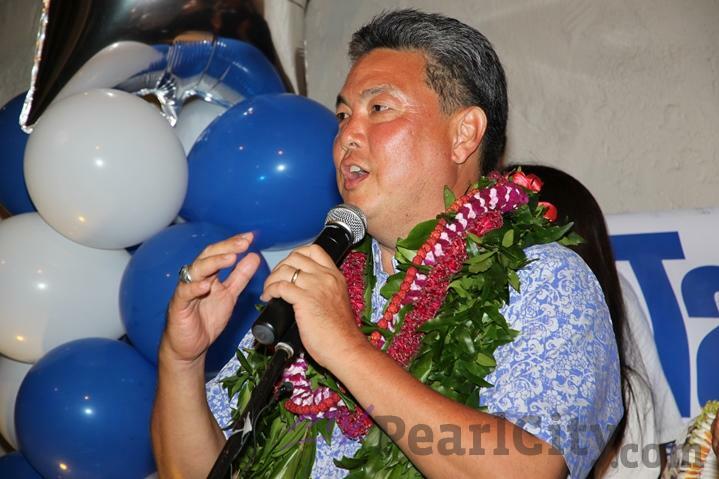 "Today I stand humbled in front of you, because if it wasn't for all of you here as a part of Team Takai, we would not be celebrating, so thank you so much for joining us," said Takai as he addressed his faithful supporters. "There are about 40 organizations and people supporting us. So many people came together because they believed in our campaign and they believe in what we can do going to D.C. and the halls of Congress." Showing their support and offering their congratulations Saturday night were two members of our Hawaii Congressional delegation, Representative Tulsi Gabbard and Senator Mazie Hirono. 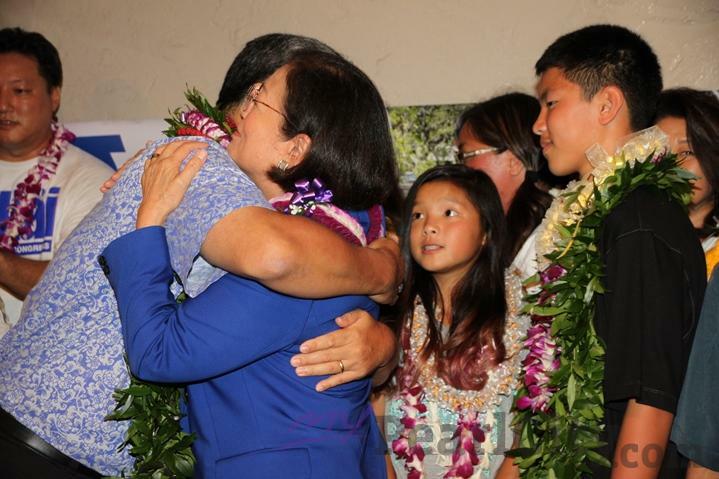 Takai closed his heartfelt appreciation message to his supporters with words of encouragement for the road ahead and the work that stilll needs to be done leading up to November, and victory. "I was telling a few people earlier today who worked very hard today as well, we didn't stop until 6 o’clock, but I said you know, if we're going to be working tomorrow, that is a very good thing, Takai said. "So I want to tell all of you here, and all of you across Congressional District I, we are going to continue our fight tomorrow, and we will remain diligent, and we will remain victorious come November."